Why invest in real estate? Why invest in real estate? Underlying use. The primary reason to buy a home is to live in it, whereas investing in commercial real estate is about profiting from ownership of the property. Income generation. Each month I pay a significant portion of my income to cover my mortgage, while not deriving any current income from my home. In commercial real estate, the owner typically receives rental income on a regular basis. Concentration. Most homeowners have only one holding. Conversely, most investors in commercial real estate diversify their investments geographically and across sectors (e.g., apartments, office, industrial and retail). There are four main categories of commercial real estate investment, with each having its own unique risk-return profile as shown in the chart below. Source: Invesco Real Estate as of Sept. 30, 2018. Ranges shown are approximate and based on current market conditions which are subject to change. It is not known whether these return objectives will be realized. For illustrative purposes only. Core. Core real estate investments include stable, fully leased and well-located top-tier properties with predictable cash flows. An example would be a fully leased office building in midtown Manhattan. Core investments have the lowest risk-return profile of the four categories. Core-plus. Core-plus properties have similar characteristics to core properties, but also have elements of additional risk. In return for taking on this risk, the owner has the potential to achieve a higher return. For example, a core-plus property might have a large tenant that is scheduled to leave. This presents a risk for the owner, as it may be difficult to find a replacement tenant. On the other hand, the potential upside for the owner is the ability to charge the new tenant a higher rent than the vacating tenant was paying — thus boosting their return. Value-add. Value-add properties are those where the owner seeks to make enhancements in order to achieve a higher return. A common example would be purchasing an office or apartment building that has grown “tired,” then renovating and upgrading the property. Once upgrades are complete, the owner may be able to charge higher rents and generate a higher return. Opportunistic. Opportunistic property investments require significant enhancements (such as ground-up developments and raw land). This category has the highest risk-return profile of the four groups. There are a variety of ways for individuals to invest in real estate. The two most common are through direct real estate funds and publicly listed real estate investment trusts (REITs). While both provide exposure to real estate, each has its own set of unique characteristics. Direct real estate. Also known as private equity real estate, direct real estate funds are investments available to institutional and high-net-worth investors that acquire, finance and take ownership of a property or properties. These funds often require investment minimums of $1 million or more and require investors to hold their investment for many years with limited ability to redeem during this period. Direct real estate investors expect to receive a premium for holding an illiquid investment, and data suggest that they historically have. As shown in the chart below, over the past 20 years, private US real estate has generated a higher annualized return than both publicly listed REITs and equities. REITs. REITs are companies that own, operate or finance income-producing real estate. The majority of REITs are publicly traded and are available to all investor types.2 Investors can own shares of a single REIT or can invest in mutual funds that hold a diversified portfolio of REITs. One of the biggest benefits of publicly traded REITs is they provide investors with liquidity while holding assets that are inherently illiquid. From a return standpoint, over the past 20 years, REITs have outperformed equities but slightly underperformed private US real estate. Source: Invesco Real Estate, S&P and FTSE EPRA Nareit using data from Bloomberg, L.P. as of Sept. 30, 2018. For illustrative purposes only. Past performance is not indicative of future results. An investment cannot be made directly into an index. Global bonds represented by the Bloomberg Barclays Global Aggregate Index. US bonds represented by the Bloomberg Barclays US Aggregate Bond Index. Global equities represented by the MSCI World Index. US equities represented by the S&P 500 Index. Global listed real estate represented by the FTSE EPRA Nareit Developed Index. US listed real estate represented by the FTSE Nareit All Equity REIT Index. Private US real estate represented by the NCREIF Property Index. In addition to generating potentially strong total returns, an investment in commercial real estate may provide investors with an attractive stream of current income and help hedge against inflation. Income. Commercial real estate generates current income through the rent and lease payments charged to occupants. Additionally, some real estate investments hold real estate-related debt, which also provides a source of current income. As shown below, real estate has historically provided an attractive level of current income relative to equities and bonds. Source: National Council of Real Estate Investment Fiduciaries (NCREIF), MSCI Capital Markets, Moody’s Analytics, Bloomberg L.P., and Macrobond. Yields are as of Sept. 30, 2018. For illustrative purposes only. Past performance is not indicative of future results. Global Bonds represented by the Bloomberg Barclays Global Aggregate Index. US bonds represented by the Bloomberg Barclays US Aggregate Bond Index. US equities represented by the S&P 500 Index. Global listed real estate represented by the FTSE EPRA Nareit Developed Index. US listed real estate represented by the FTSE Nareit All Equity Index. Private US real estate represented by the NCREIF Property Index. Inflation hedge. During inflationary periods, real estate has historically tended to appreciate, and rental/lease payments have tended to increase. 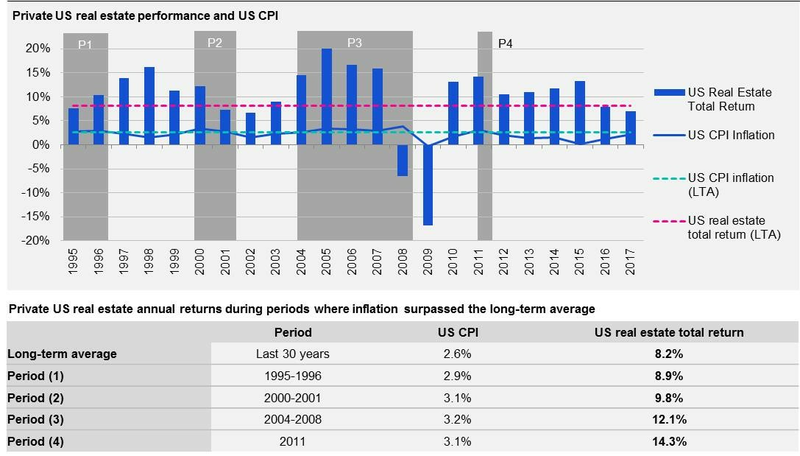 The performance of private US real estate during periods of inflation can be seen in the chart below. Source: The consumer price index (CPI) reflects CPI-Urban Consumer. All Items indexed to 1982. Analysis relates to US private real estate performance, represented by the NCREIF Property Index and includes all property types. LTA=Long-Term Average, 1988-2017. From Invesco Real Estate using data from the US Bureau of Labor Statistics, Moody’s Analytics, and NCREIF as of September 2018. Long-term average US real estate total return (8.2%) is an annual average. Past performance is not indicative of future returns. Public, non-traded REITs are registered with the Securities and Exchange Commission, but the shares do not trade on an exchange. While these REITs typically have suitability standards for investors, the limitations are far less strict than those required by direct real estate funds. Public, non-traded REITs typically invest the majority of their capital in income-producing direct private real estate, while also holding some publicly traded REITs. These REITs allow monthly investments with minimums generally similar to mutual funds. From a liquidity standpoint, they offer investors the ability to redeem (typically on a monthly or quarterly basis) subject to certain limitations. Importantly, investors should understand that such limitations may mean they are unable to redeem their investment exactly when requested. Public, non-traded REITs are usually valued on a monthly basis based upon the determination of an independent third-party appraisal of the properties held. Because the REIT is not publicly traded, the valuation is not impacted by the myriad market factors that can and do impact publicly traded REITs. In many ways, public, non-traded REITs bridge the gap between direct real estate and publicly traded REITs by allowing many investor types to own direct private real estate for mutual fund-like minimums. These also provide increased liquidity compared to direct real estate investments. This blog is the first in a series that will shine a spotlight on different types of alternative investments —which are all shown in the Invesco alternatives framework below. My next blog in the series will explore investments in master limited partnerships and infrastructure. 1 Source: Invesco Real Estate as of Sept. 30, 2018. Residential real estate represented by the FHFA Purchase Only Home Price Index. Commercial direct real estate represented by the NCREIF Real Estate Index. Data sourced from Bloomberg, L.P. as of March 13, 2019. 2 Source: Nareit as of March 13, 2019.